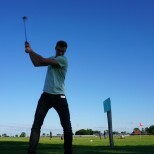 Sun, fun and swing golf! Over the last few months, several of our departments have merged together as part of our mission to develop even better games at an even faster pace. Two of those departments were marketing and conversion, responsible for ensuring the popularity of our games all over the world. To help all the Goodgamers from these two fields get to know each other better, they attended their first ever joint team event, Swing Golf, a simplified and even more entertaining form of golf. 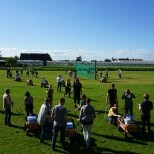 The 80 participants hopped onto a bus, getting them into the field trip mood, and rode to Ochsenwerder in south Hamburg. Once there, the randomly picked teams received their gear: clubs, balls, and – in place of a caddie – a handcart with the refreshments they would need. Even so, the golfers had to walk as many as 18 holes, and some of these were up to 250 meters long. After two hours, everyone was ready to get off their feet and forget about those balls they had already lost deep in no-man’s-land. All the team members came together again for a barbecue where they were able to refuel and continue getting to know each other better. From vegan treats to tasty meats, the barbecue offered something to meet everyone’s taste buds. Our Head of Marketing & Conversion, Thomas, took the opportunity to announce the winners of the swing golf and name Team Kirby as the champions. The team shared the gift basket packed with sweet goodies like brothers and sisters, which was not at all hard now that they knew each other so well.